Tuning out the vitriol, anger and hate. I gave up TV back in the 1990s. I was exhausted by the constant barrage of bad news and human suffering interjected by fluffy, saccharine snapshots of superficial social trends and local events. To me it is all maddening. Completely maddening to see hugely disparate reports on the status of mankind delivered in the same, polished and completely dissociated manner. It all seems so fake, because in reality, it is fake. In response I did what any good Gen-X’er would do. 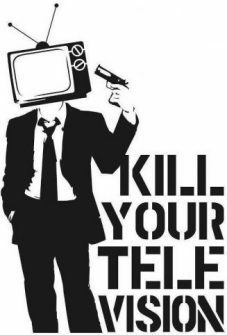 I killed my television! However, despite my abandonment of televised information and entertainment, as a human I can’t avoid my deep-seated need to know what is going on in the world. I may not like what’s going on but I feel the duty to know what is happening to my fellow souls around the world. So I searched around for media outlets that would allow me to access (mostly) unbiased views on regional and world events. I don’t want to be in the dark, but I am also over the incessant brainwashing and bias of most major media outlets. I happened upon a magazine that offers a weekly compendium of national and world events. A source that integrates and quotes various other published media insights and opinions into their articles. This magazine makes me feel like I am getting a well-rounded view on issues and events. And I believe that it does just that. I went on to subscribing to this magazine and have joyfully anticipated the weekly arrival of all the news of the past week. Warts and all. The insightful and succinct news articles delivered to my door for my casual yet concerned consumption meets my need to feel connected and informed. Despite my need to know I often skip over Page 4. This page is my Achilles heel. This page is always an analysis of the most pressing issue du jour. This page is what I consider an analysis of the “ugly” part of politics and our global reality. Simply put, I skip the ugly because I don’t want to know about it. I really don’t. Especially when events are particularly controversial and painful. We live in complicated times. I get that. We always have, but to me some of the world’s woes are just too much for me to take. I am not interested in reading about anger and hate, and that’s okay. Most newsworthy items are things that are completely out of my control. These are things that have immediate and often long-lasting effects on who we are as a society. These are things that, more often than not, also drive the increasing division, hostility and negative energy in our society. It’s exactly that negativity that gets to me, I just can’t deal with it. I don’t want to engage in low-frequency anger and hostility. I can’t stand it. It’s not something I enjoy and it’s not a level of intellectual and spiritual torture I feel I need to impose upon myself. Today, I tried to read through the most recent issue of that news magazine. I found that I had to pass over every page. I kept searching and searching for articles that I could read but none of them resonated with me. There’s a whole lot of issues to worry about in the world. I couldn’t even read past the headline for most of the articles. Humans have been angry and reactive to absolutely everything since time immemorial. Life is hard and people are complicated. Life is complicated. However I subscribe to a totally different approach to life. Until we can collectively engage as civil and loving humans in this crazy world I don’t feel the need to feed my brain and my body with all the negativity and anger in the world. I prefer to engage my mind, body and soul in what I know to be the real truth of human kind. We are all capable of love, compassion and understanding, and until I see that reflected in my media sources I will continue to willfully and happily default to focusing on the positive that exists in this world. It’s okay to let the anger play out around you. You can’t stop that. What you can do is hold space for yourself and the peace and love you know that truly surrounds you. Tune out to the negative and focus on the positive people! It will help save your life. You too deserve peace and love. We all do. Be the peace and love you want in the world. On the whole, we can change this place. Together we really can! I’m a health, wellness, and healing blogger who has struggled with and overcome two major episodes of autoimmune disorders, severe Psoriasis and Crohn's Disease. My website is devoted to sharing my insights and musings about my ongoing practice of consciously staying healthy.